"Bombardment of Fort Sumter by the batteries of the Confederate states," illustration from Harper's Weekly, April 27, 1861, courtesy of the Library of Congress, Prints and Photographs Division. 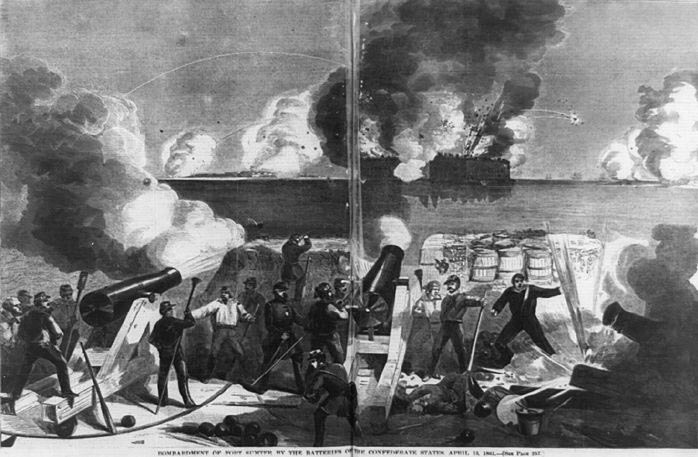 The bombardment of Fort Sumter in Charleston, South Carolina, was the first military conflict of the American Civil War. Charleston native and Liverpool businessman Charles Prioleau facilitated financial support and helped to procure arms to the Confederacy throughout the war. In 1861, Prioleau sent a Whitworth cannon the state of South Carolina, which reportedly fired the first twelve-pound round towards Fort Sumter. The Civil War that divided the United States from 1861 to 1865 was a national conflict with international consequences. Great Britain's status in the nineteenth century as the world's leading imperial power meant that U.S. politicians in both the North and South sought British support during the war, but the stakes were particularly high for the Confederates. With most American industry located in the North, the predominantly agrarian Confederate states hoped for access to British financial institutions, factories, and trade networks to launch an independent economy from the Union. The Confederacy also needed military supplies from British factories to fight the war, and political leaders of the separatist South desired recognition from foreign governments. For these reasons, Jefferson Davis, the Confederacy's president, saw British support as vital to their cause. "Laborers returning at sunset from picking cotton," Mount Pleasant, South Carolina, photograph by George N. Barnard, ca. 1861-1880, courtesy of the Photography Collection, New York Public Library. The British government initiated the abolition of slavery in various parts of the British Empire in 1833, but businessmen in Great Britain continued to trade with regions that supported slavery, particularly to import cotton from the U.S. South. In return, British merchants and factory owners benefited from access to the agricultural exports of the southern states—particularly cotton. In the first half of the nineteenth century, the British government had dismantled its slavery system through the abolition of the trans-Atlantic slave trade in 1807, and finally the Slavery Abolition Act in 1833, which initiated the emancipation of enslaved people in the British Caribbean. Still, the country continued to rely on imports produced by enslaved labor. By the beginning of the U.S. Civil War in the 1860s, popular opinion in Britain was overwhelmingly anti-slavery, but many British merchants maintained significant trade connections with regions where this institution was prevalent, particularly the U.S. South. In the mid-nineteenth century, the port of Liverpool in northern England had the ability to service many of the Confederacy's industrial and military needs. The city offered supplies, a thriving shipbuilding industry, and a market for trading Confederate cotton to British textile mills. It was also home to a number of merchants who actively promoted trade with the southern states. By the 1860s, a group of Liverpool merchants even worked together in what was known as the "Southern Club" to promote their shared trade interests. 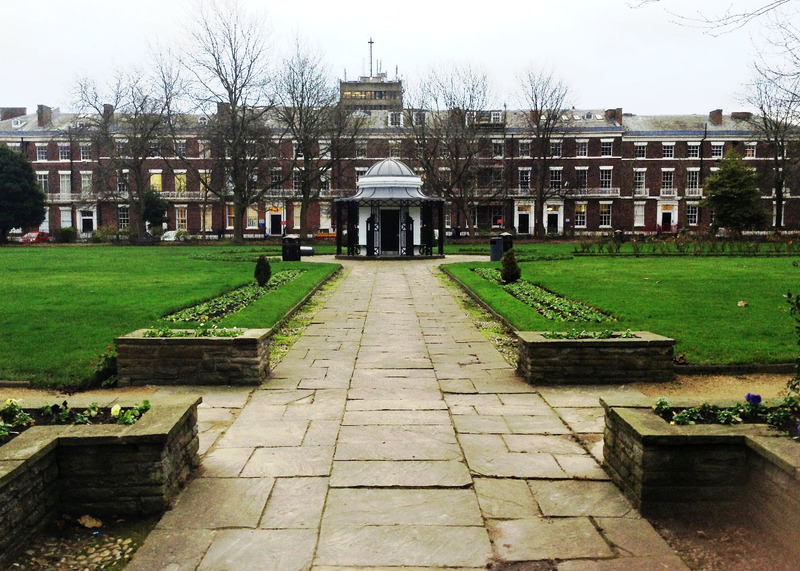 Many of these merchants lived in Abercromby Square, Liverpool's most elite neighborhood. Their Southern Club had existed in various forms for decades, but by 1862 its members became more organized in response to the Civil War. The Southern Independence Association also had branches in various areas of northwest England, most notably Manchester. The Liverpool branch of the "Southern Independence Association" explicitly supported the South's secession from the Union. Abercromby Square, photograph by Chris Williams, Liverpool, England, 2015. By the 1860s, several residents of Abercromby Square belonged to a self-proclaimed "Southern Club", which supported their trade interests with the U.S. South. A driving force behind both Liverpool's Southern Independence Association and its Southern Club was merchant James Spence, who lived at 10 Abercromby Square with his American-born wife, Mary Anne La Serre. Charles Kuhn Prioleau, a native of Charleston, South Carolina, was another resident of Abercromby Square who belonged to the Southern Club and served as treasurer for Liverpool’s Southern Independence Association. From his home at Number 19 Abercromby Square, Prioleau exploited personal and business connections to greatly benefit the Confederate cause. He was also a partner and the managing director of the Liverpool-based trading company Fraser, Trenholm, & Co., which was owned by South Carolina native George Alfred Trenholm. Trenholm’s import/export business developed out of a company owned by John Fraser in Charleston, South Carolina. At the start of the Civil War, under Prioleau’s supervision, Fraser, Trenholm, & Co. became the unofficial European bank for the southern states. The British Government was committed to neutrality during the American Civil War, at least until the outcome of the conflict became clear. Still, popular sympathies and political opinions were often divided within Great Britain between ongoing trade connections to the U.S. South and more widespread anti-slavery sentiments. Within this emotionally and politically sensitive context, many Liverpool merchants were determined to maintain and expand their trading interests in the southern states.